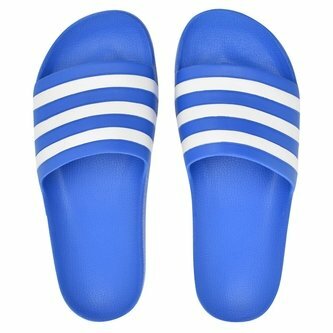 With a casual style and lightweight cushioning, the adidas Adilette Aqua Cloudfoam Slide Flip Flops in True Blue, White and True Blue are ready to be slipped on in a sporty fashion. Wear these flip flops at the beach, in the changing rooms, around the home or anywhere else you want to get the fresh air to your feet. These sliders come with pillowy-soft comfort whilst being made with a cloudfoam plus footbed to help your feet feel energised. A stylish blue look to these sandals sees the signature adidas three stripes decorated in white on the over-the-foot strap.